Free binary teaching tool: How does 2s complement work? My GCSE Computer Science students need to understand how to convert positive numbers into 8 bit binary. Today, my Y10s had to teach this to the Y6s visiting for their new Y7 induction day. After the Y6s had gone off for an early lunch, my Y10s had to discuss how they would extend what they knew about binary to allow computers to understand negative numbers as well as positive numbers. The end result was an explanation of 2’s complement and how it works, using this free interactive binary teaching tool. There are 26 letters in the English alphabet. 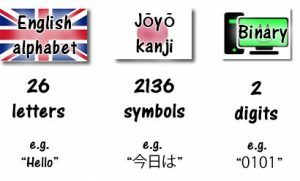 Even in simplified Japanese Kanji, there are over 2,000 symbols. The digital electronics that makes computers work can only understand two possible states: electricity switched on and electricity switched off. That’s why binary is used so much in computers: a binary 1 or 0 can be processed with electronic switches and stored in electronic ‘memory’. Even though computers only ‘understand’ 0s and 1s, they can combine multiple 0s and 1s to represent any number, image, sound or anything else. Free teaching aid: How does 2s complement work? How can positive numbers be represented in binary? In the same way that you can combine letters in the English alphabet to make any word, you can combine 0s and 1s in binary to represent any sort of data. The easiest sort of data to represent is an unsigned integer. Unsigned means that it’s a positive number: it has no + or – sign. Integer means that it’s a whole number: it has no decimal point. Each individual 0 or 1 in a binary number is called a bit. As you look from right to left at a binary number, each bit is worth twice as much as the one on its right. The bit on the far right is known as the least significant bit: it’s only worth 1. To convert from binary into decimal (what most people think of as ‘normal’ numbers) you have to add together all of the values of bits that are set to 1. Experiment with this interactive tool to see how to convert from binary to decimal and vice versa. How can negative numbers be represented in binary? This would work but would be a massive waste of memory: you’d need twice as much RAM to store negative numbers and you’d have to redesign CPUs to handle negative numbers in a different way to positive numbers. Converting between the two types would be a waste of processing power. So, the way forwards is to take the most significant bit of a binary number (the bit on the far left) and keep the same absolute value but make it negative. Note that the most significant bit (MSB) is now worth -128 rather than 128. The advantage of representing negative numbers this way is that for any positive number where the MSB was 0, the binary is the same as it would be if we’d used our good old fashioned normal way of representing binary numbers. You can also quickly tell if any number is negative by looking at the MSB: it’s negative if the MSB is 1 and it’s positive (or zero) if the MSB is 0. This method of representing negative numbers in binary is called 2’s complement. Experiment with this interactive tool to see how to convert from binary to decimal and vice versa. 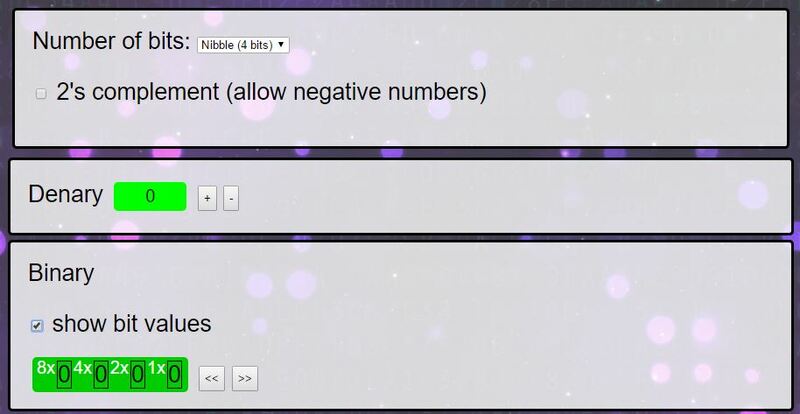 Tick the 2s complement box at the top to experiment with negative numbers. How do you convert a 2’s complement binary number into decimal? In this example, the MSB (most significant bit, on the left) is set to 1 so we can know that the number is negative. So the 2s complement binary number 10001000 represents the negative number -120. The digital electronics that makes a computer work doesn’t know (or care) if 10001000 is 2s complement or not. It could just as easily represent the positive number 136 (128 + 8). The computer processes the binary data (for addition, subtraction etc…) in exactly the same way. It’s down to the software rather than the hardware to remember if the binary data is a signed (2s complement) number or an unsigned (positive) number. This can sometimes lead to some pretty catastrophic software failures when programmers aren’t aware of how computers handle negative numbers.